WordPress 101: Because WordPress is really easy to use, once you know how. Are you just getting started with WordPress? Then you’ve come to the right place! Our WordPress 101 Series is written with you in mind. These WordPress lessons take you step-by-step through some of the basics to get you going on your WordPress website or blog. Be sure to sign up for our newsletter (and get a free WordPress Tips & Update guide) or like our Facebook page to be notified about new WordPress 101 articles. Log into your dashboard and start a WordPress post. When you’re done writing the post instead of publishing it, I want you to look to the right of the editing area. Do you see the Publish block? Note the line that says Publish immediately. That’s your ticket to being able to schedule content to publish at a later date! Click on the edit after Publish immediately and a scheduler appears. Select the date and time that you’d like your post to be published. Then click the Publish button. 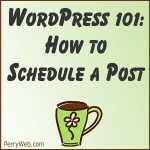 Your blog post is now scheduled and will be published on the day and time that you specified. If you’d like to learn more about WordPress contact me about one-on-one WordPress Coaching. Previous Post: What’s a xmlrpc.php file? Why is it Showing as a Broken Link?